New Forest Life Tales, Issue #006 --<> My New Forest woodpecker tale. Did my favourite foal survive acorn poisoning? Welcome to my New Forest Life Tales Issue #006 November 2010. My favourite New Forest foal is poisoned by acorns. As you know, I live in the beautiful New Forest National Park and each day I mix with all the ponies,donkeys,cows and pigs and piglets. The animals come to our fence and naturally you have a few favourites. They all have different personalities and characters. I know people who aren't animal lovers find this hard to believe. A lovely, oldish strawberry roan (a pinky brown colour) mare, always produces really stunning New Forest foals and this year was no exception. The little foal soon got its "land legs" and became a real character. She would be outside our gate and was always very curious if we were sitting reading in the garden, or having a summertime cuppa just looking at the animals. Although you should never touch a New Forest animal, she was quite tame. We had lots of cuddles with her as we had got the owners permission. It's funny how fate can play a hand in life. Last Friday, instead of coming home around six o'clock when it's pitch black outside, I was able to finish at 4pm. I arrived home in the light and saw the little foal outside our cottage. She looked very sad and wasn't her usual curious self. My husband said she hadn't really wandered about like she normally did. When I went out to her I examined her. Had she been kicked, knocked by a car or eaten acorns? Any one of these choices could be very bad news. I watched her for a little longer. She had no heat in her legs or any obvious impact injury, but she did look "tucked up". Imagine if you have a really painful tummy, you will find standing is uncomfortable and you will probably be holding your tummy muscles tightly in. By now the New Forest ponies usually head off to the heathland and gorse for the night. The mare called out a whinny to her foal to say "come on, we're all off now". The foal let out a weak and plaintive whinny as if to say "I can't move I don't feel well". It was really quite heartbreaking. Mum came up and gave her a sniff over, and then she realised something was wrong too. Here she is at just a few hours old in May 2010. I decided I wasn't happy to let this rest - I also knew that if anything was to be done it would have to be before darkness set in. I tried contacting her owner, and then luckily got in touch with a friend who knew both the mare and foal well too. She immediately came along and agreed that all was not well. Luckily, her owner arrived and decided that the worse case scenario was likely. She was suffering from acorn poisoning and could easily lapse into a full blown colic. Colic is a killer and also causes the animal extreme pain. We decided we would have to box both mum and foal up and take them off the forest for treatment. Hopefully, we would be in time. 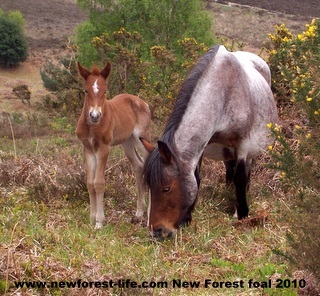 All Commoners who keep their animals on the New Forest must have the facilities to remove them so they can be treated if they become ill.
Getting a canny and quite fiesty old mare and her foal who is used to living only on the New Forest into a trailer was not going to be easy. 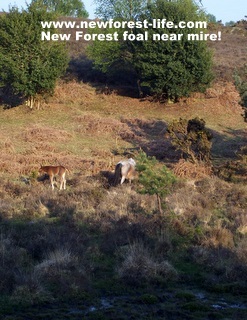 By now it was dark which was another challenge to this New Forest foal rescue operation! Luckily, mum is very greedy, she spends her whole day eating. I really mean she eats all day long! With the help of a bucket of pony nuts she was very slowly encouraged into the trailer - her gluttony overcame her natural caution. Mind you I couldn't believe how quickly she could devour a bucket of nuts! Once she was chomping away it was time to load the little foal. She was scared but didn't want to be left without her mum. Eventually she too was loaded in. The acorns were by now having a toxic effect on the little foal. They were causing extreme constipation which allowes the toxins to work better and the poisoning to take control. The solution was to administer liquid parafin, by mouth in large quantities and hope it would work quicker, i.e. cause the gut to start to empty before the acorn poisoning was too far advanced and full blown colic and death occurred. Luckily, the owner was able to apply lots of parafin and by midnight a poo was the result. This meant there was a chance of survival. By the next morning more poo had been achieved and the little foal was much brighter. Heaven knows what her poor little tummy felt like! She has now made a great recovery and is getting back to full health. Her character and natural curiosity has returned. Whether she will eat acorns again in the future we don't know. Because she is such a lovely little foal she may not return to the New Forest again - I think her owner thinks one scare of this seriousness in a lifetime is enough for her. I'm just so grateful that I came home early that night and was able to see her in daylight. I don't think she would have survived the night if the acorns had been able to really take hold all through the night! Thank heavens she chose our cottage to be ill in front of and didn't go deep into the forest where no one would have spotted her. A New Forest Tale with a happy ending. Visit New Forest Life There are loads of pictures of my life in this UK National Park throughout www.newforest-life.com I really hope you enjoy them.